Justin Vernon and Aaron Dessner of Big Red Machine. 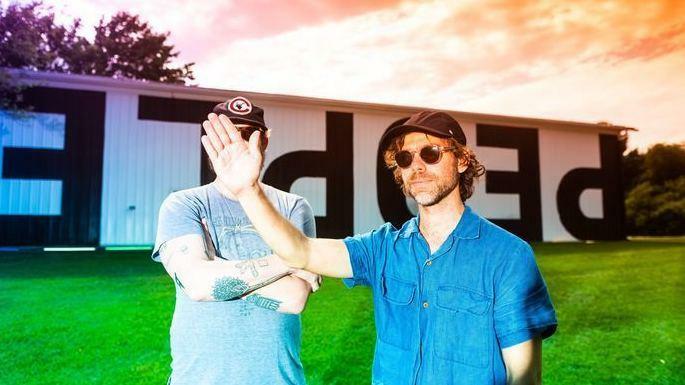 Last month, Bon Iver's Justin Vernon announced a collection of ambitious new collaborations with The National's Aaron Dessner, within a new band together called Big Red Machine --Dessner's brother Bryce has joined the duo in launching a music platform called PEOPLE and an August concert event in Berlin. The announcement of PEOPLE's launch came with the release of four new Big Red Machine songs, each of which pairs Vernon's ambiguously beautiful words and voice with Dessner's busily unpredictable sound collages. Now, the band has announced that it's got a full-length, self-titled debut — recorded with an assortment of guest collaborators — for release on August 31. A full track list is below, but in the meantime, you can revel in fully 40 percent of Big Red Machine's recorded output right here. "I Won't Run From It"
Big Red Machine comes out August 31 via Jagjaguwar.